A man carried the dead body of his seven-month-old niece on a bicycle after being denied for an ambulance, in perhaps another shocking display of disregard for humanity. The incident took place on 12 June when the girl Poonam died during a treatment at the district hospital. The girl was admitted to the district hospital after complaints of vomiting and frequent motion. After admitting the girl to the hospital, father Anant Kumar left for Allahabad to arrange some money for the treatment of her daughter asking his brother-in-law Brijmohan, to look after her. "We have taken cognizance of the incident. An inquiry has also been initiated," Chief Medical Officer (CMO) S.K. Upadhyay, Kaushambi said. "I called an ambulance driver several times to provide, but he refused to come. At last, I had to take my niece on a bicycle," Brijmohan said. Reportedly, an FIR has been lodged against the doctor on duty and the ambulance driver, who allegedly refused to carry the body. In a similar incident, on June 5 in Bihar, a man carried his wife's dead body on a motorcycle to reach his home for her last rites as he was denied a mortuary van at a government hospital. 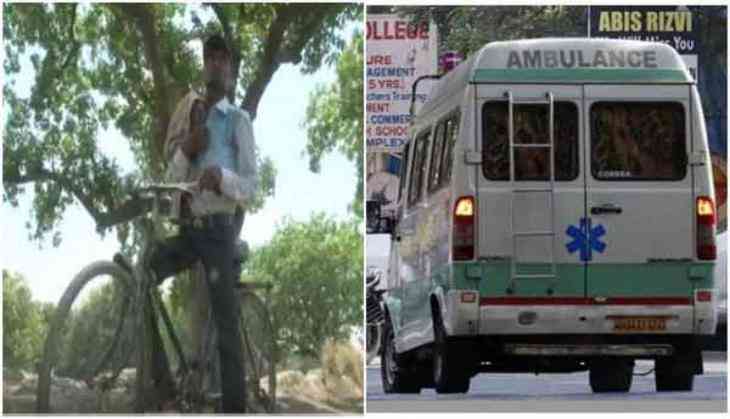 On 21 May, a man was forced to carry the body of his dead wife on a stretcher after the hospital authorities refused to render an ambulance service to him in Kaushambi.